Dyna-Glo isn’t exactly a huge player in the outdoor grilling market but this 4 burner upon its release got a lot of people talking. The talk was about power, versatility, supreme quality and one of the best looking grills ever made. 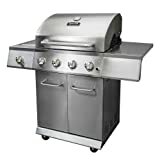 Naturally, I was intrigued to find out for myself, if it really is that good, so I wrote this Dyna-Glo DGE Series Propane Grill 4 burner Stainless Review so I could explain to buyers what this grill has to offer. The first thing buyers need to know about the design is that it’s heavy duty stainless steel and weighs 96 pounds, so it’s not a grill you want to move around a lot. The weight is because of the sheer amount of stainless steel used, and it’s quality, so buyers are getting a very durable, excellently made grill that will last for years. Measurements are 22.6 inches of length, by 50.7 inches of width, and it stands at a height of 46.8 inches, which is certainly larger than the average grill on the market. You get massive storage space beneath the cooking surface, and with its sleek finish and lid, it looks like one of those commercial units you find in the kitchens at top restaurants. I wish all grills looked like this. The assembly of this grill takes around 2 hours, but it’s not tricky, and buyers won’t have any trouble with it. The manual and built-in nuts help a lot. 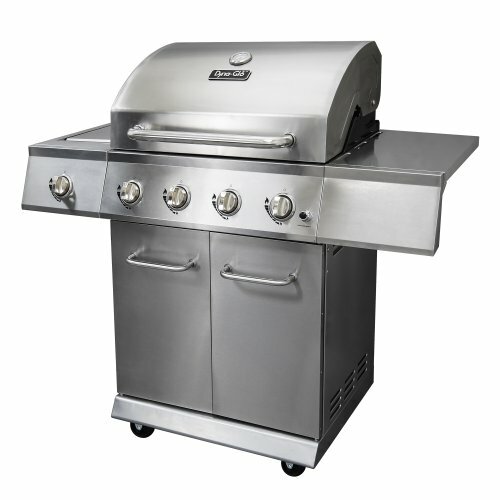 Once assembled, you have a fast ignition and one of the most powerful grills on the market. There’s so much power here, that even the most ardent charcoal grill fans, might think about switching. The 4 burners equal of a total of 40,000 BTU’s, and there also a helpful 12,000 BTU side burner, so there’s a total of 52,000 BTU’s on this grill. I mentioned earlier, that the Dyna-Glo looked like a commercial grill, and the 4 main burners are commercial grade, so quality is assured. Another thing of note is that the side burner has some great temperature settings, so users can lower the heat for sauces. When you add the beauty of the stainless steel finish to this, and the 646 square inch cooking surface, you begin to see why this grill received such high praise after release. With this amount of cooking space, you can invite as many people over as you want, and you’ll never run out of space. To experience all of this power and cooking space, buyers will have to purchase an LP tank separately, which is slightly annoying, but Dyna-Glo has provided in their design, a tray loading system, so the tank can be slotted into the back of the grill easily. The Dyna-Glo DGE 4 burner has steel grates and because these aren’t as good at distributing heat evenly, as cast iron grates, manufacturers always have to think of a solution, to ensure even cooking. Dyna-Glo has developed some wonderful heat tents made out of stainless steel, that protect the burners, and serve to project heat outwardly, and evenly, over the entire cooking surface. The result is supremely grilled food with an amazing taste. There’s a temperature gauge built-in to the grill, and it’s very accurate, although buyers should be aware of the fact, that when you open the lid, the temperature drops dramatically. I certainly didn’t notice any difference in the quality of food, because of this, but it doesn’t help with cooking speed. Buyers should also be aware of the huge storage space here, with 2 doors opening out to reveal enough room for all the kitchen essentials. The Dyna-Glo, being made out of stainless steel, is easy to clean. Just a quick wipe over after use is really all that is needed. At around $350 for all this power and cooking space, the Dyna-Glo has to be regarded as one of the best investments out there. Surely one of the best propane grills currently available. The 2-hour assembly is a little arduous, and it’s rather unnecessary that they didn’t include an LP tank, but with the beauty of this design, in its fabulous stainless finish, commercial grade burners, and 646 square inches of cooking space, I must advise buyers that this is a great deal. Food will be evenly cooked thanks to the heat tents covering the burners and the storage is spectacular.